The Merope Nebula is a faint reflection nebula and suspected supernova remnant located in the Pleiades cluster (M45). The nebula surrounds the star Merope (23 Tauri), after which it gets its name. It has the designation NGC 1435 in the New General Catalogue. 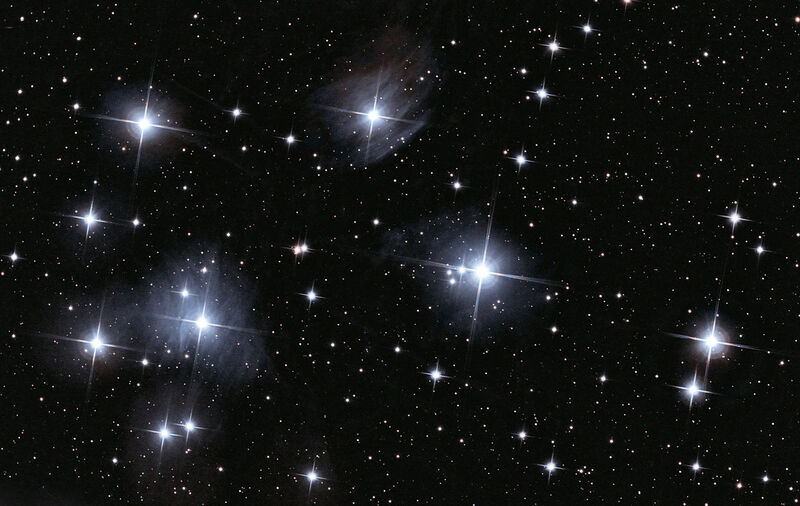 The Merope Nebula is the brightest reflection nebula in the Pleiades cluster. It is also known as Tempel’s Nebula. It was discovered by the German astronomer Wilhelm Tempel from Venice, Italy on October 19, 1859. 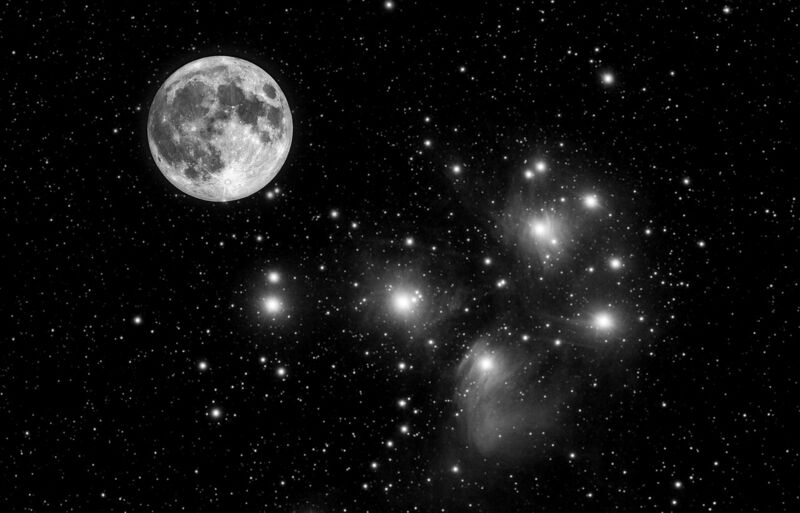 Tempel used a 4-inch refractor to observe the famous open cluster. The brightest part of NGC 1435 has an apparent magnitude of 13, but most portions of the nebula are fainter than magnitude 16. The nebula appears brightest around Merope, the bright star that illuminates it. Merope is a blue-white subgiant with an apparent magnitude of 4.113, belonging to the spectral class B6IVe. With an absolute magnitude of -1.07, the star is 630 times more luminous than the Sun. It is also more than four times larger and has a mass about 4.5 times solar. It lies at an approximate distance of 360 light years (110 parsecs) from Earth. Merope is classified as a Beta Cephei variable, a type of variable star that shows variations in brightness as a result of pulsations of its surface. The star’s brightness varies by 0.01 magnitudes. This image shows a dark interstellar cloud ravaged by the passage of Merope, one of the brightest stars in the Pleiades star cluster. Just as a torch beam bounces off the wall of a cave, the star is reflecting light from the surface of pitch-black clouds of cold gas laced with dust. As the nebula approaches Merope, the strong starlight shining on the dust decelerates the dust particles. The nebula is drifting through the cluster at a relative speed of roughly 11 kilometres per second. The Hubble Space Telescope has caught the eerie, wispy tendrils of a dark interstellar cloud being destroyed by the passage of one of the brightest stars in the Pleiades star cluster. Like a flashlight beam shining off the wall of a cave, the star is reflecting light off the surface of pitch black clouds of cold gas laced with dust. These are called reflection nebulae. Image: NASA/ESA and The Hubble Heritage Team STScI/AURA), George Herbig and Theodore Simon (University of Hawaii). 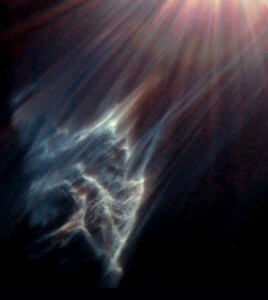 The Merope Nebula is not part of the cloud in which the Pleiades stars were formed, as previously suspected. It is only an interstellar cloud through which the famous cluster is currently passing. NGC 1435 is the most conspicuous reflection nebula found in the Pleiades cluster, but not the only one. The nebula contains a small bright knot, designated IC 349, that is located only 0.06 light years from Merope. The knot was discovered by the American astronomer Edward Emerson Barnard in November 1890 and is also known as Barnard’s Merope Nebula. Barnard observed the knot using a 36-inch telescope at the Lick Observatory in California. IC 349 is about half an arc minute wide. It is the brightest part of the Merope Nebula because it lies so close to the central star. The Merope Nebula covers an area of 30 arc minutes in size, which corresponds to a linear diameter of 4 light years. It was the only reflection nebula in M45 known to John Herschel, who added it to his General Catalogue as GC 768 in 1864. In the next several thousand years, the nebula – or what is left of it after the encounter with Merope, which is eroding the interstellar cloud – will move on past the star.